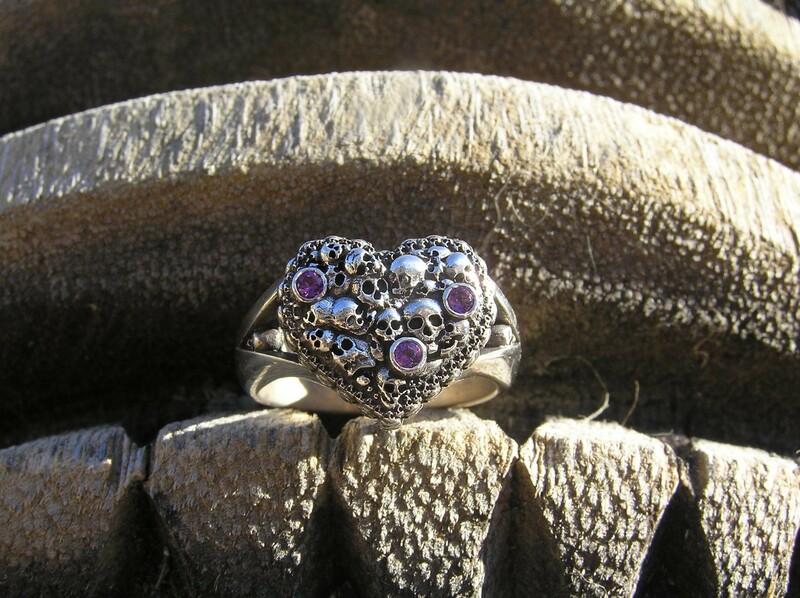 with Amethyst price $300 So, once I designed the Spartan Heart pendant, I knew I had to do a ring. In the center of the heart is more than 28 skulls, including a conjoined pair. Outline the heart is a row of 53 skulls, with another row of 53 skulls facing out from the shank below them. And, for good measure, there is a tiny skull on each side peaking out of the split shank. There are 3-2.3 mm bezel-set stones nestled amongst the skulls. The heart is 14.4 mm high x 16.25 mm wide, and the shank tapers down to 6.8 mm in the back. Sterling silver. Design Notes: This pendant was inspired by the opening scene of the movies "300" in which the Spartan babies are being culled and thrown into a pile. This is my take of the skulls lying in the pile of discarded parts, and they are laid-out in the heart shape which is acknowledging the broken hearts of the mothers of the culled Spartan infants.